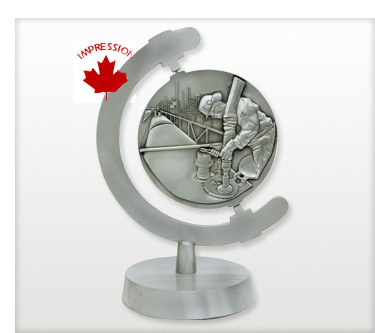 One of our customers commissioned us to produce this item, involving both sculpting and engraving, with a world globe on one side and on the opposite side they had a copy of the airplane. Solid Pewter $26.00 $21.50 $20.00 $16.50 each. The one time die charge will be quoted after we review your artwork. If a faster shipping is required, there will be a US $500.00 rush charge fee. To find the earliest shipping date available for the delivery you require, please fill in the Contact Us Form with the item number you are enquiring about and the delivery date you need.